In January, Trisha and Amy took a much-anticipated journey to India, where they met with female artisans, sourced materials and gathered inspiration for new collections. Throughout their two-week adventure, they stopped in Delhi, Jaipur and Mumbai, exploring each city’s unique beauty. Delhi offered inspiration in a myriad of sounds, tastes and colors. There, Trisha and Amy reviewed final designs for the ASH + AMES 2015 Spring and Fall Collections. They took time to enjoy local establishments, including the eclectic Delhi cafe, Good Earth. 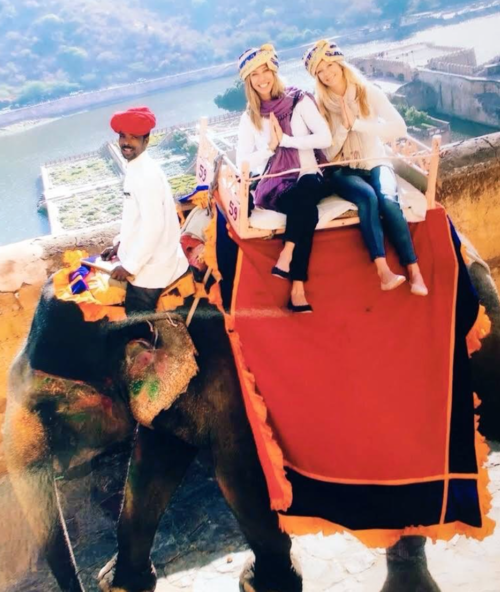 In Jaipur, Trisha and Amy explored the majestic Amer Fort and Saffron Flower Garden. Later they visited the Govind Temple and savored a warm welcome from the female community there. In Mumbai, the pair spent time with local designer Maya from Mayabazaar. They’ll be working with her to create original Indian-inspired designs for 2015.